Rapid self-repairing roll-up doors are the technological evolution of old PVC strip curtains or folding doors, which are inappropriate for the current industry needs. The Supermarket model of our rapid flexible roll-up door is designed to meet the needs of companies operating in the supermarket industry. Each of our Supermarket roll-up door is equipped with a powerful engine, capable of opening and closing the door very quickly and especially safely, thanks to a security monitoring system with a lateral photocell. 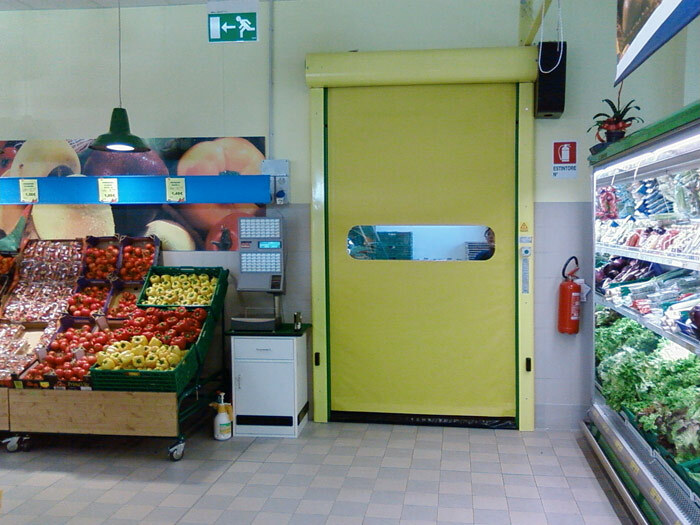 The Supermarket roll-up door is available in galvanized steel or, upon request, in stainless steel, both easy-to-clean and rust-resistant materials.